Socrates (470-399 BC) would be pleased to see his philosophy of enquiry-based learning underpinning Socrative; the easy to use, quiz resource for teachers. By using Socrative, you can test your students’ knowledge to gauge their current level, check ‘in-lesson’ concept learning, and add interaction to classes as students respond via their mobile device. 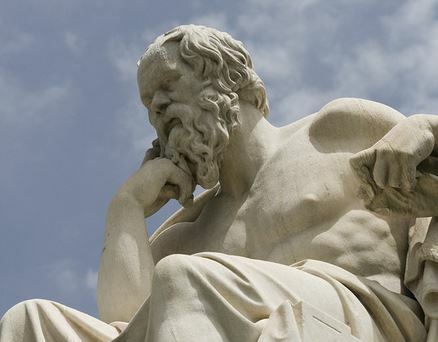 Invite Socratic methods into your teaching by signing up for Socrative and merge the ancient philosophy of Socrates with the modern technologies and devices that we use today. Socrative is a smart ‘student response’ system. It allows you to engage with your students via a series of polls, quizzes and games that you design. After setting a simple quiz you can give instant feedback, and track the students’ progress over a period of time. Students are able to access and answer the quizzes via their smart devices, either as part of the lesson or from home. Socrative steps: how does it work? Kitty is teaching a class on the history of philosophy. She wants to use a Socrative quiz to test the students knowledge at the beginning of the session, and then again at the end to assess what the class have subsequently learnt. Kitty logs into Socrative and sets up a quiz, or a virtual ‘room’ with multiple choice questions. She then gives the students the virtual room number. The students go to www.socrative.com and type in the room number to enter the quiz room. They can do this via either the Socrative app, or their web browser. From their device, the same quiz that is on the teaching screen will appear on each of the students’ devices. Kitty teaches her history of philosophy class. Towards the end of the class, Kitty relaunches the quiz and the students repeat the quiz. Kitty can now compare the results from before and after her lesson and adjust future learning plans around the data. 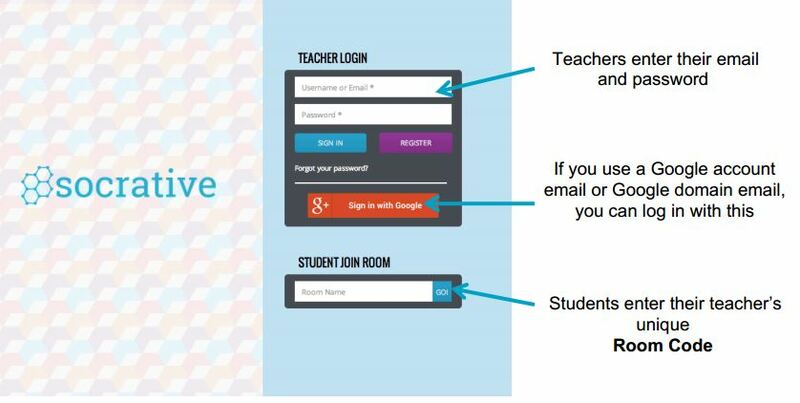 You can sign up to Socrative for free using your email address or Google mail account from either a computer or a mobile device. Once you have signed up, you can create quizzes which contain either multiple choice or short answer responses, and then select the correct responses. You can also choose to leave general feedback for the question, or feedback dependent on the student’s response. What are the benefits of Socrative? Socrative does not integrate with presentation software (e.g. PowerPoint). 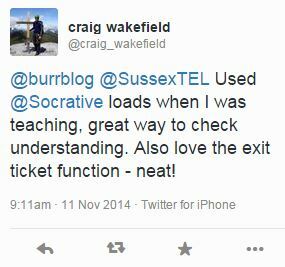 An excellent feature for teachers is the Socrative ‘exit tickets’. Students can report what they have learnt, what they would like to learn more of next time, and whether they enjoyed the lecture with just a flick of a key. Socrative is a great tool. Don’t just take our word for it though. Here is Teacher and Learning Technologist Craig Wakefield’s opinion, with kind permission to republish. 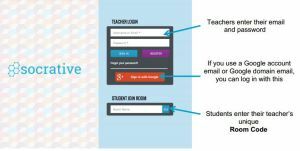 A comprehensive Socrative user guide is available for tutors who are new to using the service but would like to give it a try. If you would like support in using Socrative, please get in touch with your School Learning Technologist. Have you signed up yet to the TEL blog? Make sure you are emailed each post by signing up (just above and to the right in the blue bar) via your email address. You won’t be pestered, but you will have the delight of the latest TEL blog post dropping into your email each week. Thanks to @Craig_Wakefield for kind permission to publish his Tweet. 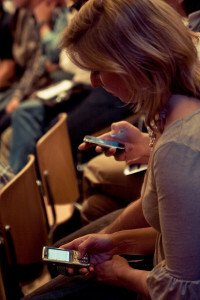 ‹ Learning on the move – Mobile Technologies Week! 2 Pings/Trackbacks for "Are you using Socrative? An engaging tool to quiz student understanding"